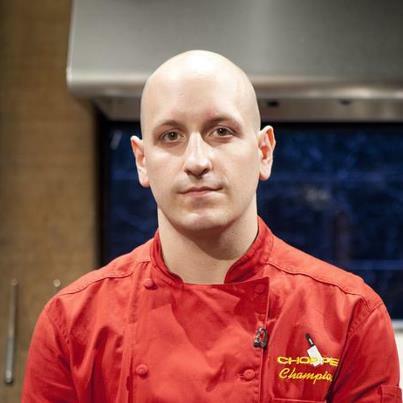 A few weeks ago, we had the privilege of being invited by Sean Scotese to attend his Chopped viewing party, as he was a contestant on Chopped Champions edition. If you’re avid fans of the show like we are, you surely remember Sean winning the Halloween episode. As we entered 200 Orchard Street, we immediately struck up a conversation with Sean along with some of his friends and guests that were there to root him on. This was definitely a different experience watching the show for us since we’re accustomed to watching it from our couch. With each round, you can feel the anxiety in the room as we all watched Sean prepare his meals under pressure. The crowd cheered and applauded as Sean made it past the appetizer and entrée round, setting up his final round “battle” with Chef Kenneth Johnson. Once the desert round was finished and the judges had to decide the winner, the room was filled with anticipation hoping for Sean to be named Chopped Champion once again. When Ted Allen revealed Sean’s plate as the one that was Chopped, the room filled with major disappointment. We were sad for Sean but happy to meet him, as he shared his experience on the show and his plans for his restaurant Ghost Street. Here is what Sean had to say about his experience on both episodes of Chopped. FP: On either Chopped or Chopped Champions, what was the most challenging ingredient to cook with? SS: The most challenging ingredient was probably the pig snout in the appetizer basket the first time I was on Chopped. There really aren’t many ‘quick’ things to do with something that has so much skin involved. Ideally you’d really want to be able to slow cook/render it and then sear it over medium-high heat until crisp. Seeing as we only had 20 minutes the idea was to break it down by cutting it small and add that much needed textural contrast through a crispy breading. FP: What was the most challenging entree round? The most challenging entree round was definitely Chopped Champions. Fish heads and cookie dough is a tough line to connect on the fly. On top of the extra dis-jointedness of those ingredients there is a minimum level of work needed to get anything useable from the fish head so time becomes even more of a crunch. FP: What were the similarities and differences between the two shows? SS: The similarities of Chopped to Chopped Champions are stronger than the differences. You still have the wacky limitations that are universal with the shows’ format either way. I consider myself lucky to have been on a ‘special holiday’ competition my first time in the kitchen because the exposure to those extra difficult ingredients softened the curve ball of the Champions baskets. There is a real effort by the producers to throw you for a loop with both the Halloween and Champions episodes’ ingredients and I feel that is ultimately the equalizer. Most cooks can do well w/ quinoa, pork neck, saltines and Pepsi if needed, that is basically making family meal at 50% of NYC restaurants. The only real difference between Champions and the first time around is the fact that everyone involved has a certain level of familiarity with the process and has overcome it once before. You don’t get the same type of advantages as when everyone is new. It’s all just about who can do it right, play by the rules and make the best plates under duress. FP: You’ve done both shows now…would you consider other cooking competitions in the future? Ex. Top Chef, Iron Chef etc. SS: There has been nothing but positive feedback and great memories from my experience on Chopped. I would love to be a part of something again in the future! (Champions redemption round.. the 4 second place finishers from this year vie for a spot in the next finale?!) It is rare that we get the opportunity to test ourselves outside of the day-to-day comfort zone we all operate in with such a fun and different format. I am a competitor at heart and love finding new ways to put my passion for food into actions. I also always welcome a challenge and fully understand the benefits that TV appearances can bring to a business (especially a new one). Some of my best friends have gone through the Top Chef or Iron Chef obstacle courses and I know it was a truly great experience for them. I originally passed up those opportunities because I felt like there was a certain stigma in the industry 5 years ago to be a part of ‘reality cooking.’ You are always going to have to take the good with the bad when it comes to that level of exposure. Going forward my hope is that I can take part in exciting opportunities that present themselves and not have to compromise any personal convictions to do so. FP: Thank you Sean again for your time! We look forward to hearing more about you in the future!